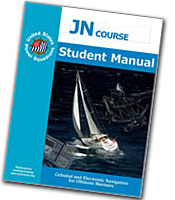 Junior Navigation – the title is traditional, the subject matter is quite advanced. This is the first of a two-part series in offshore navigation. Again, the emphasis is on safe and effective electronic navigation. However, outside sight of land and navigation aids, you are taught to use the sun. The basics of celestial navigation are instructed and you take sights on the sun to derive fixes of position. You also learn about the unique conditions and considerations in offshore navigation.